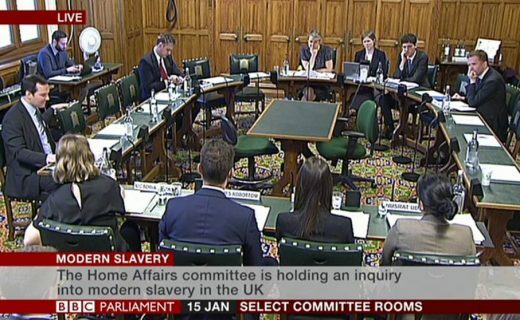 Following on from Wilson’s submission to the Home Affairs Select Committee’s Inquiry on Modern Slavery, Nusrat Uddin was invited to give evidence in Parliament. She attended the meeting of the Committee chaired by Yvette Cooper MP on Tuesday, 15 January 2019. Nusrat was able to give direct practitioner evidence in connection with how the UK’s systems continue to fail victims of trafficking and particularly drew on her research and her successful litigation in the case of client K where she established that a 40% reduction in financial support to asylum seeking victims of trafficking from £65 down to £37 per week was wholly unlawful. Drawing on her research she was able to identify a much better regime in the USA where victims of trafficking receive much better support in the criminal justice system and are given a four-year visa which lead to settlement and family reunion. This is extremely important as most victims fear deportation and reprisals from their traffickers in their home country. Without long-term adequate support and protection they are likely to be unable to be able to engage with any police investigation or prosecution process. Nusrat gives a vivid account of the enormous practical difficulties in properly representing victims of trafficking who also have immigration problems and the impact of the hostile environment. The Inquiry comes at a crucial point when the Home Office are drafting key guidance on support of victims of trafficking. The proceedings in the Select Committee can be seen in full at the following link. Wilson’s submissions can be found here.